The world used to be a lot more connected, geologically speaking, than it is now, thanks to rising ocean waters, melting ice caps, and dramatic tectonic shifts. One of the geographical features that helped to connect and diversify the flora and fauna on this planet is the land bridge. The most historically important land bridges linked continents and brought new life and culture to parts of the planet that were previously inaccessible. Some were Atlantis-like sunken nations like Doggerland (now deep below the North Sea) and some emerged out of the ocean with the help of volcanoes. Many land bridges offered the possibility of a new life at a time when long-distance ocean travel was a deadly proposition. Here's a look at the land bridges that helped shape history and the planet's landscape. 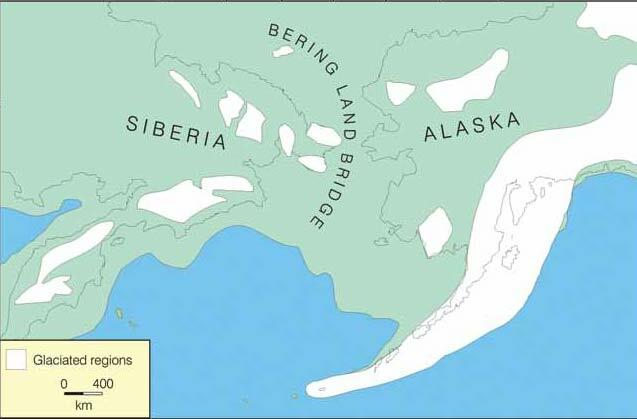 The granddaddy of all land bridges, the swath of land known as Beringia allowed humans to make thier way in droves to the Americas about 15,000 years ago. Now buried under freezing water, this gateway between continents was also the scene of a transcontinental animal exchange: horses, camels and bears made their way into Asia while bison, mammoths, and moose migrated to North America. Located smack-dab in the cradle of civilization, the Sinai Peninsula has served for thousands of years as a land bridge connecting Africa and Asia (as well as Egypt - one of the most famous scenes from the Bible and Quran supposedly took place here: Moses delivering the 10 commandments to the Israelites). It's also home to the Suez Canal, history's first large-scale, man-made, water-based shortcut, connecting the Mediterranean Sea to the Red Sea and changing world trade and travel forever. Around the time of the last Ice Age, the United Kingdom as we know it today was united, literally, with the European continent thanks to a chunk of long-lost earth known as Doggerland. The massive land bridge was actually a "paradise" for humans and animals around 8,000 years ago, before the rising North Sea swallowed it up. It featured marshes and mudflats and hosted all manner of flora and fauna. That's right: before the British isles were isles, they were the Doggerland highlands. It's hard to imagine, but North and South America used to be two separate continents with a body of water scientists call the Central American Seaway between them. But then nature found a way to make a love connection: around 4.5 million years ago, a land bridge now known as the Isthmus of Panama emerged after underwater volcanoes formed islands that were slowly linked via massive sediment deposits. A land bridge was born! Biodiversity on the planet was changed forever: species such as cats, dogs, armadillos, and porcupines crossed the bridge to broaden their territory. In 1914, the U.S. finished the Panama Canal on the isthmus, connecting the Atlantic and Pacific Ocean and forever changing maritime trade.